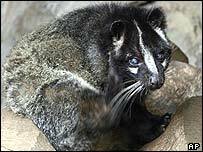 The World Health Organization says it has found evidence suggesting that civet cats do carry the Sars virus. Its inspection team in the southern Chinese province of Guangzhou found traces of the virus in a restaurant where a suspected Sars patient worked. It appears that the virus may differ slightly from that involved in the last outbreak which killed 800 worldwide. Traces of the virus were found on cages in the restaurant where civet cats were kept as well as in a wildlife market. WHO experts say it is good evidence that Sars originated in animals. But they still do not know how the disease spread to humans and whether it leapt from civets or from another animal. Chinese scientists announced a link between civets and Sars more than 10 days ago, prompting the slaughter of 4,000 animals in Guangdong Province. But that has been a controversial move and one official in Beijing has criticised the slaughter as excessive. There has been one confirmed new case of Sars in southern China so far and two suspected ones. None have yet infected other people. Scientists in Hong Kong say they believe it is a new virus strain which is harder to pass on. Chinese authorities have also announced a high alert against bird flu following an outbreak in neighbouring Vietnam. Poultry imports from South Korea, Vietnam and Japan have been banned. The World Health Organization has warned that bird flu could be a bigger problem for the region than Sars since humans are less well-equipped to fight the virus.